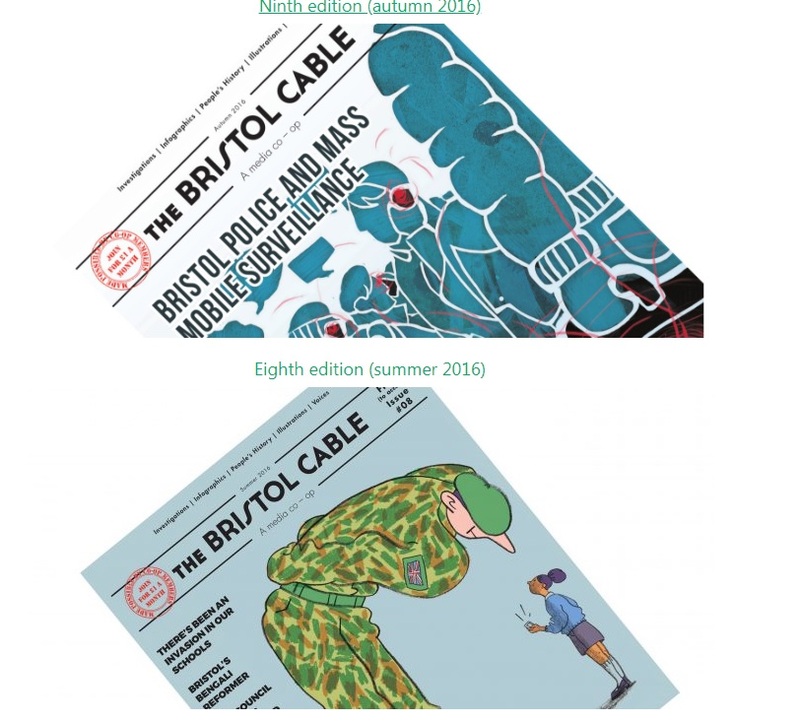 The Bristol Cable- a model for sustainable local journalism? The Bristol Cable has been cited by many as an example of a ‘best practice’ independent local news organisation. MSc student and Silverstone Scholar Anthony Graham-Dillon spoke to Cable reporter Matty Edwards, about the Cable’s co-operative business model, drive for media diversity and literacy and the challenges of producing public-interest journalism. Q: The Cable is clear about its commitment to the issues that matter in Bristol, can you tell us a bit about your relationship with your membership and your readers? How does your model ensure you stay on the pulse with the issues that matter to them? The Cable is a cooperative so we are owned by our members. There are now 2,000 of them and we want them to get involved as much as possible – whether they come to our monthly meetings or AGM to tell us what we should be doing, or becoming a contributor, volunteer or source for stories. We host monthly members’ meetings to give people a chance to get behind the scenes insights into our journalism but also so we can find out what people care about and what we should be covering. We have recently taken these meetings to deprived areas of the city to listen to people whose voices aren’t usually heard. We are also about to launch a new freelance scheme so the people who create Cable journalism are from a broad range of backgrounds and can therefore accurately tell stories about the diverse, complicated city of Bristol. Q: Studies indicate that local news has shifted over time away from hard news topics associated with information that equips readers to be informed local citizens, towards news about consumer issues, entertainment and human-interest stories. As your membership grows and becomes more diffuse in its interests, is this a tension you anticipate? How can hyper-locals mitigate this effect? Firstly, we are not a hyperlocal – we cover the whole of Bristol and sometimes beyond. The move away from hard news and public interest journalism is a big problem in local media, because the traditional business model makes it difficult to divert resources to in-depth reporting, whereas an article that’s going to get clicks, such as about Love Island, is more worthwhile because of how digital advertising revenue works. While there is still a lot of great reporting on important issues in local media, it’s becoming more difficult to sustain. This decline is public interest news is what the Cable is trying to address. Our model allows us to dedicate time to stories that might not get lots of clicks but really matter to the city of Bristol, such as transparency around affordable housing in the planning process. Human interest stories have become more prominent, but this is not as problematic as the dominance of entertainment and consumer news. Public interest journalism is at its best when it includes a human interest story. When you investigate a topic that is important but technical and dense, you need to make people care. For example, our recent campaign to stop Bristol City Council using bailiffs to collect unpaid council tax really took off when people with personal experience got in contact. We were then able to tell human stories of people being hounded by bailiffs for a £1 debt – that gets through to people. Outlining the harshness of the government’s ‘hostile environment’ government policy won’t have much impact, but telling stories of Windrush immigrants facing deportation, being refused healthcare or having their benefits frozen – that has serious impact because people care about people. Q: Ofcom reported on the potential for hyper-locals to support and diversify local media at a time when traditional providers are under financial pressure, yet funding remains a chronic issue for hyper-local outlets too. What strategies do the Cable have in place to ensure the sustainability of the platform in the long term? The way to make the Cable sustainable in the long-term is to grow our membership. We currently rely on grant funding, but as we get more members that can become our main source of funding, which is far more stable than grants that you have to apply to for every few years. We’re showing that membership models can work for local news, but we need to do more to convince more people why it’s worth being a Cable member. Q: Media literacy has been cited as a potential solution to the decline of public trust in journalism, which has been exacerbated by the proliferation of fake news and algorithm-driven hyper-segmentation. Can you explain some of the work the Cable is doing to improve media literacy among citizens? As a cooperative, we want our members to be media literate and part of the media we produce. We encourage them to get involved, write stories, give tip-offs to journalists. We think owning your media is a great way to be more media literate. This can be by playing a part in the media we produce, from writing stories to giving tip-offs and volunteering. But also you can become more literate as a Cable member by simply understanding how a media organisation works, how news is produced and the media landscape as a whole. Before the Cable even started publishing journalism, we held free media workshops. This focus on training remains central to what we do. Every year, we now run a free training course called the Media Lab, which is funded by the Centre for Investigative Journalism. Every year, 10-15 trainees, who don’t need any media experience, get free sessions in the fundamentals of journalism. They learn hard skills, what makes a story, media law and ethics, as well as sessions from guest speakers. Just this year, we’ve had a keynote speech from Gary Younge and training sessions from award-winning local investigative journalist Emma Youle and data journalist Leila Haddou. The aims of the course are to develop skills of community contributors, at a time when opportunities to get into journalism are few and far between, to amplify voices that aren’t often heard and make links with different communities in the city. Q: Recently, The Guardian reported that 51% of leading journalists and 80% of editors are privately educated, while numerous other studies have indicated that the industry remains dominated by white, middle-class men. June saw the most recent installment of your New Media, New Generation series, how are you using the project to address the issue of diversity? The media is too white, too male and too middle-class and this is a problem with the media that we think about a lot. We are currently integrating more diversity strategies into our recruitment practices. Media Lab is one way we try to help people to get into the media who might not have had the opportunity otherwise. We are also about to hire a community media coordinator, whose job it will be to help people get involved in journalism who have the enthusiasm but not necessarily the skills. They will be targeting a range of communities in Bristol to make our journalism more diverse and representative of the city. In April 2018, we organised an event to explore and address the lack of diversity in the media sector, attended by a range of early career professionals, young people, academics and individuals from a range of community and mainstream media outlets. Arising from groups discussions came widespread agreement that opportunities for collaboration and professional learning are a key pathway to diversifying access to variety of media and journalism. We took this forward to organise a networking event in June 2018. The theme for this event was new forms of media with the aim to showcase and network individuals and groups who are working to produce exciting initiatives and new takes on the media sector. The event included short talks by a young journalist, and a documentary film maker with extensive links in the sector. The participants were encouraged to talk about current challenges and what kind of opportunities they were looking for in order to foster potential collaborations. We aim to do similar events with different themes in future.